NES Holy Diver (JPN) in 14:52.57 by Vatchern & adelikat. Here is a game that was made as a tribute to Ronnie James Dio and features him as the main character. Also, the name of the game is taken from Dio's band's Holy Diver album. Beside that, the ending contains additional references to other famous rock/metal figures. 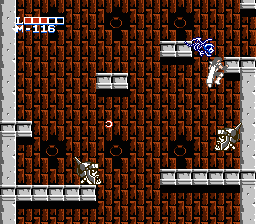 Gameplay of this game is very similiar to Castlevania and some textures and the last boss are similar to Contra's. This game is also known to be nearly impossible to complete on a real console. This is a 1 minute 36 second improvement over the previous movie due to the use of new tricks, weapon selection, and some new shortcuts.